A largely residential neighbourhood at the northern end of Diagonal, Les Corts is also the financial district of Barcelona. It’s a mere 15 minutes from El Prat airport. Visitors who want to get a feel for what it’s like to live in Barcelona will find it here. Quiet residential streets peppered with a few attractions create a quiet and unique experience of the city that you won’t find anywhere else. The Les Corts areas is divided into three districts. The first is aptly named Les Corts. The other two are the Maternity and San Ramon. These two names come from the San Ramon parish located in the former and the House of Motherhood located in the latter. All three districts are rich in history, which is evident as you wander through. Though Les Corts is a 45-minute walk to downtown Barcelona, the neighbourhood is well served with metro stops that can whisk you there in short time. The area is awash with the big banks (including the headquarters of La Caixa – a large Catalan bank) and other financial institutions that serve much of Barcelona, but you can also find quaint shops and restaurants to make your stay in the city memorable and enjoyable. If you want some night life to round out your trip, see the Elefant, a gathering place of the rich and famous in Barcelona. Make sure you dress up if you decide to check it out so that you'll fit in. Relaxing Les Corts is just a short ride to the city, but also offers you a great old village feel that satisfies any desire. 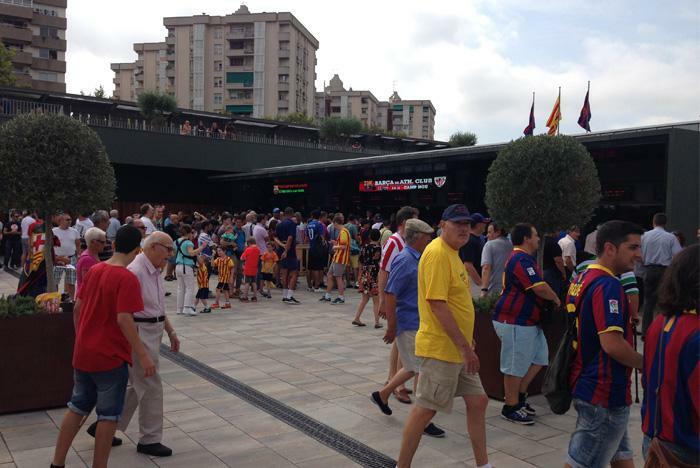 Though it is mostly financial and residential, Les Corts, also boasts some attractions for tourists and visitors - particularly for fans who are in the city to see Barcelona FC. When you aren’t admiring the architecture, seek out one of the many other things to see. The number one attraction of Les Corts is undoubtedly Camp Nou (or Nou Camp if you’re British) – the stadium of FC Barcelona. Catch a game or take the stadium tour. L’illa shopping district is also located in Les Corts and provides a wide variety of opportunities to pick up souvenirs while you’re on holiday. Don't miss Purificacion Garcia, Zara and Custo. From Les Corts it’s only 15 minutes to Sants-Monjuic with all its entertainments and sights and beautiful Plaça Espanya is also just a 15-minute stroll away.